Download "The Concept. How Cassettair can benefit you. Applications. 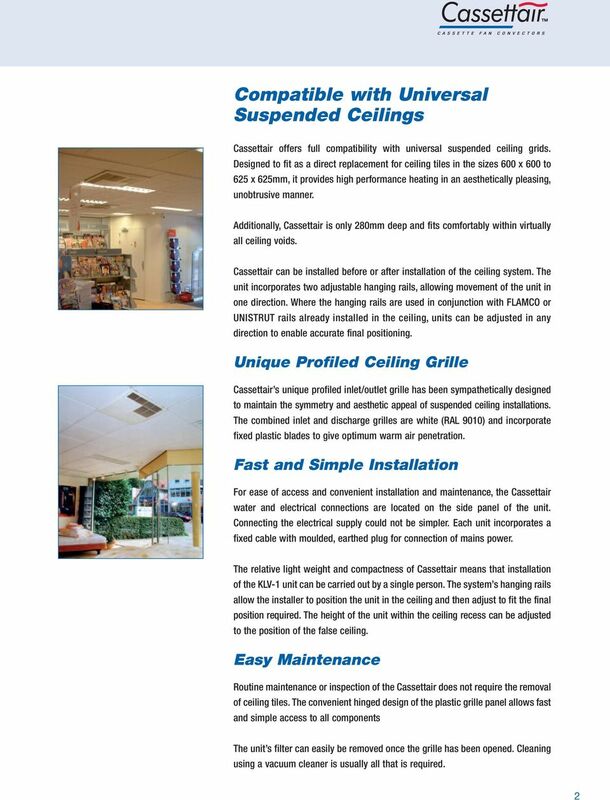 Selecting Cassettair"
2 The Concept A Europe-wide research and development programme identified the need for a high performance cassette fan convector, powered by low pressure hot water and compatible with universal suspended ceiling systems. 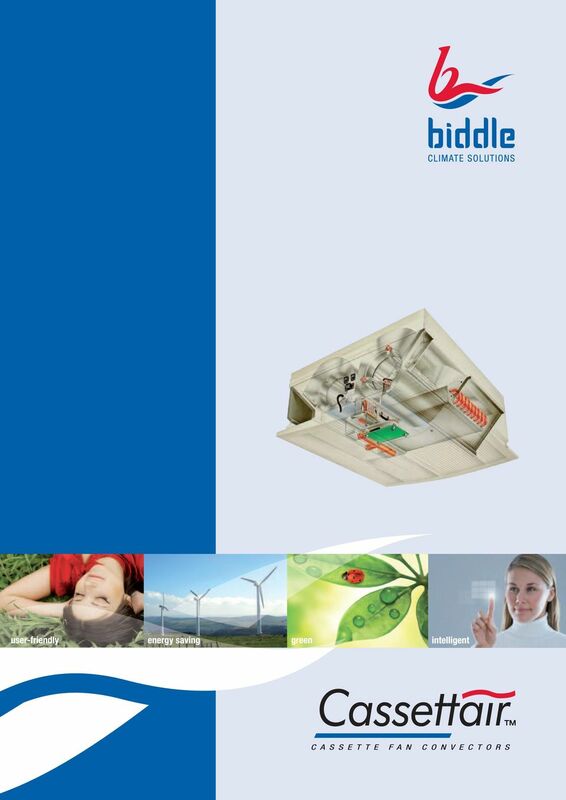 The result is the awardwinning Cassettair ceiling fan convector from the European leader in climate control - Biddle Air Systems. 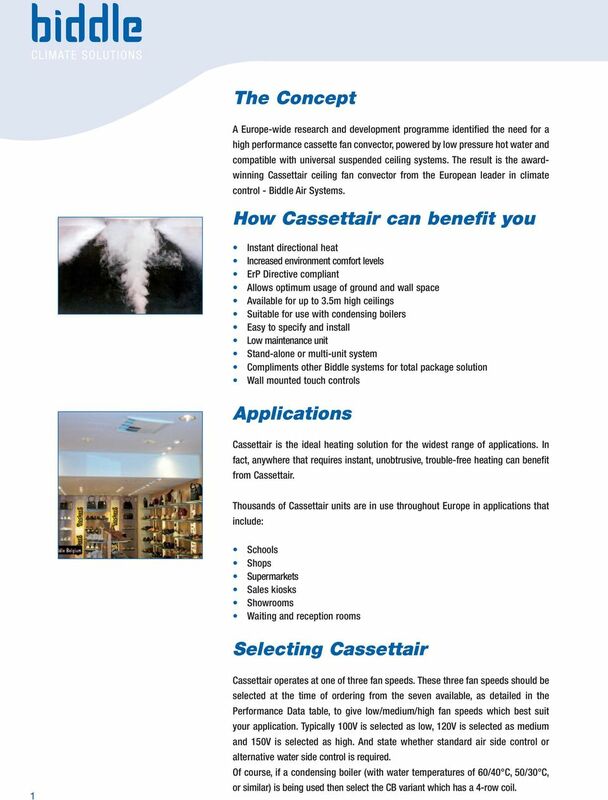 How Cassettair can benefit you Instant directional heat Increased environment comfort levels ErP Directive compliant Allows optimum usage of ground and wall space Available for up to 3.5m high ceilings Suitable for use with condensing boilers Easy to specify and install Low maintenance unit Stand-alone or multi-unit system Compliments other Biddle systems for total package solution Wall mounted touch controls Applications Cassettair is the ideal heating solution for the widest range of applications. In fact, anywhere that requires instant, unobtrusive, trouble-free heating can benefit from Cassettair. 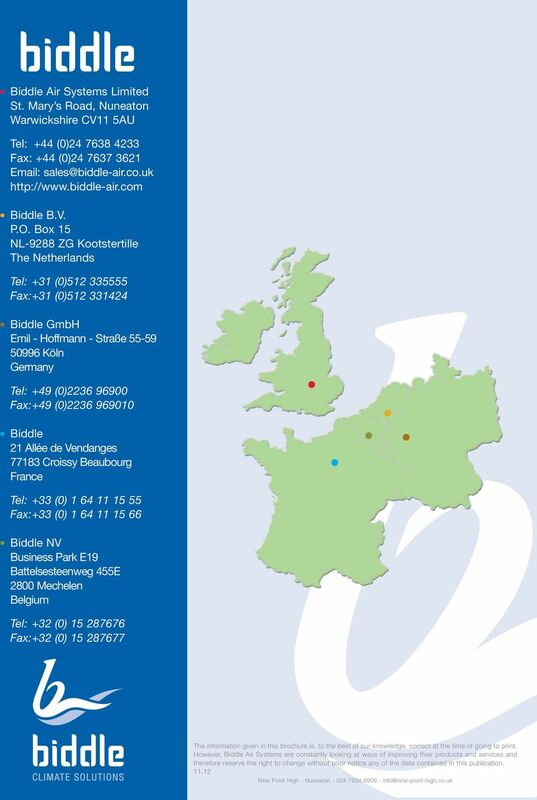 Thousands of Cassettair units are in use throughout Europe in applications that include: Schools Shops Supermarkets Sales kiosks Showrooms Waiting and reception rooms Selecting Cassettair 1 Cassettair operates at one of three fan speeds. These three fan speeds should be selected at the time of ordering from the seven available, as detailed in the Performance Data table, to give low/medium/high fan speeds which best suit your application. Typically 100V is selected as low, 120V is selected as medium and 150V is selected as high. 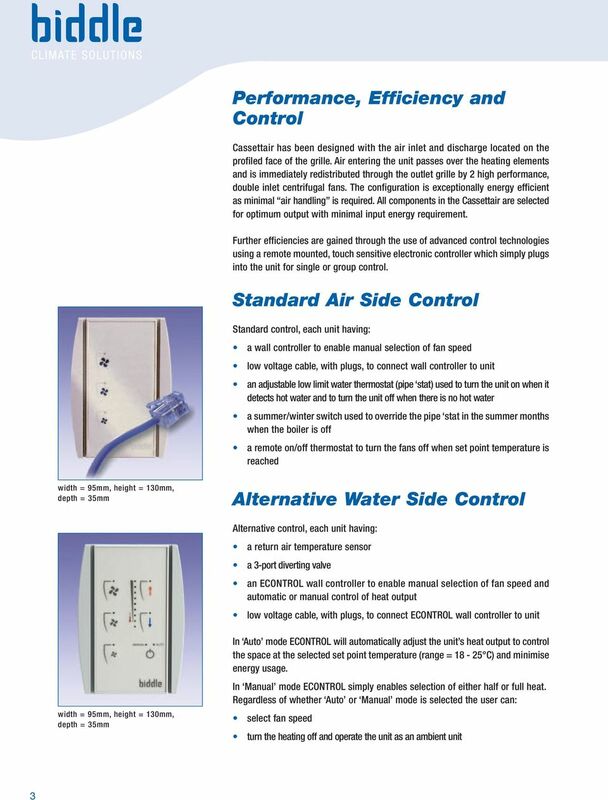 And state whether standard air side control or alternative water side control is required. 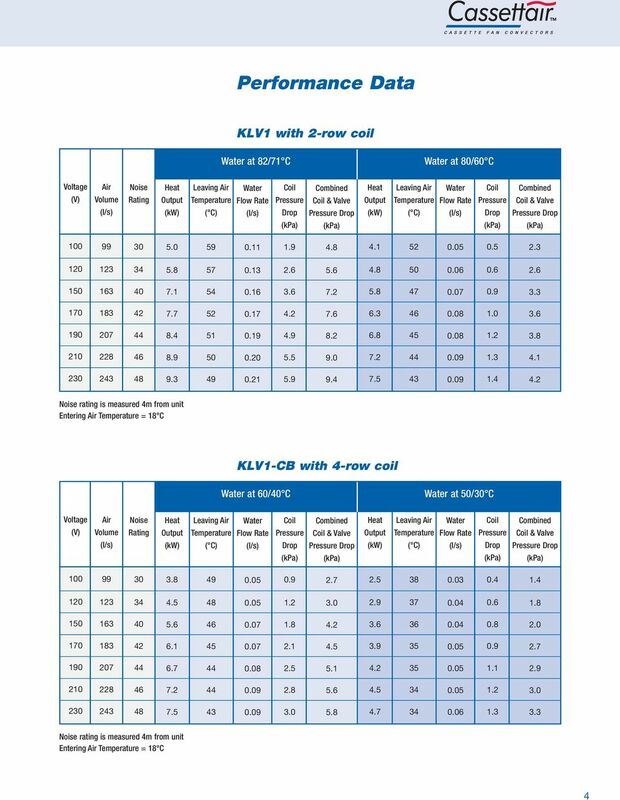 Of course, if a condensing boiler (with water temperatures of 60/40 C, 50/30 C, or similar) is being used then select the CB variant which has a 4-row coil. 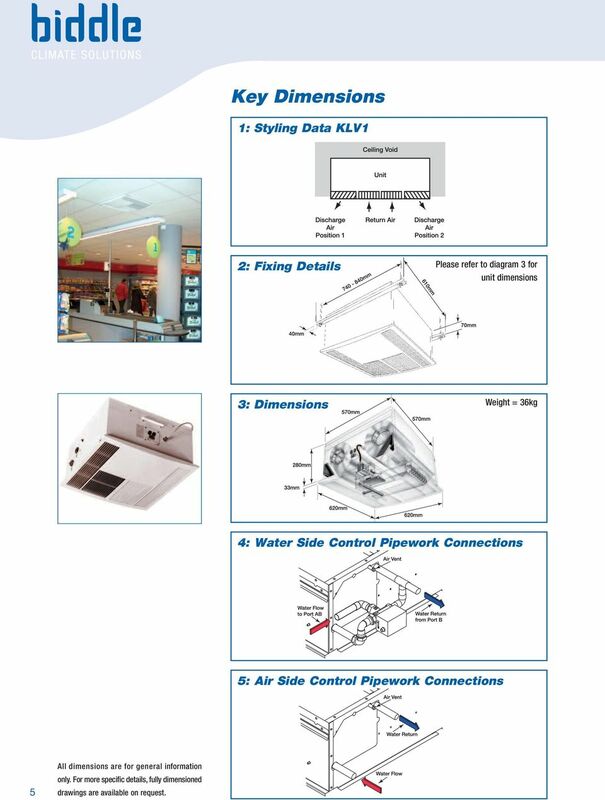 6 Key Dimensions 1: Styling Data KLV1 2: Fixing Details Please refer to diagram 3 for unit dimensions 3: Dimensions Weight = 36kg 4: Water Side Control Pipework Connections 5: Air Side Control Pipework Connections 5 All dimensions are for general information only. For more specific details, fully dimensioned drawings are available on request. 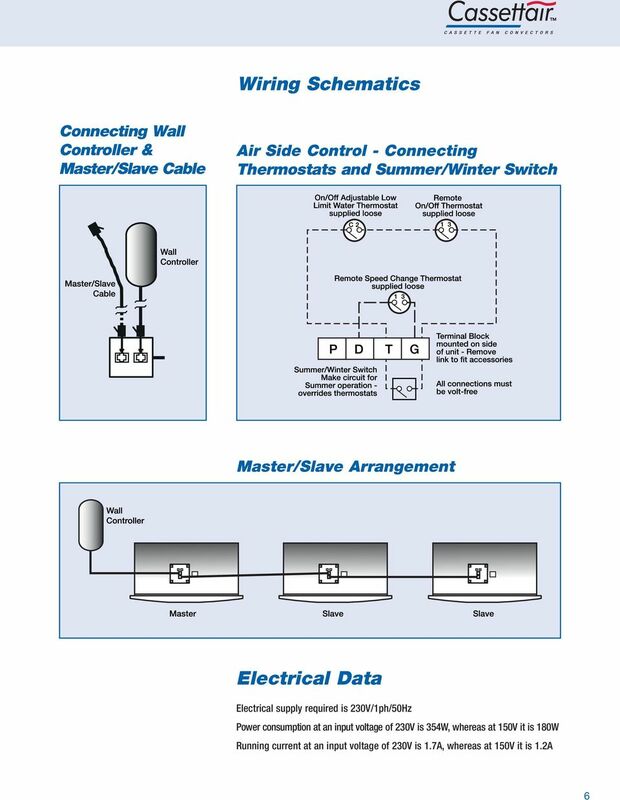 Construction Services Heating and Hot Water Services Controls General Technical Specification Version 1.0 Environment Heating and Hot Water Services Controls General Technical Specification Contents 1. We have been working in an ideal climate for thirty years. The solution for Europe: Type 2 charging socket with or without shutter The charging socket for the Europe plug. Now also with shutter. Europe needs a standardised charging connection for electric vehicles.